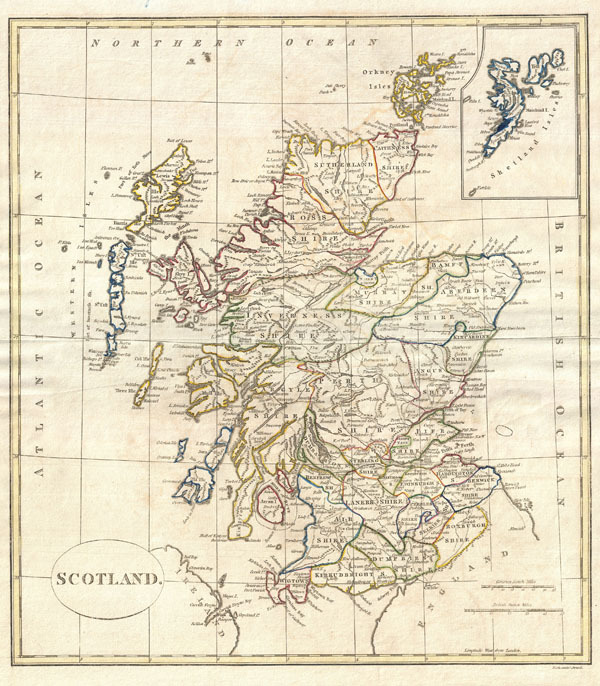 A fine 1799 map of Scotland by the English map publisher Clement Cruttwell. Covers the entire region in great detail, including a detailed inset of the Shetland Isles. Here all the counties are labeled as Shires, as the word 'county' did not become common usage in Scotland until the nineteenth century. In the north are Caithness, Sutherland, Ross, Murray, Aberdeen, and Bamff Shires. With the exception of the merger of Ross Shire and Cromarty Shire, these counties are still in existence today. In central Scotland are the Inverness Shire, Kincardine Shire, Angus Shire, Argyle Shire, Fife Shire and Perth Shire. Further south are the Shires of Renfew, Dumbarton, Edinburgh, Haddington, Berwick, Lanerk, Air, Kirkudbright, Dumfries, Selkirk, and Roxburgh. Lewis Island, in the North, is attached to Rofs Shire. South of Lewis Island is North and South Uist Island, and Coll Island, which retained baronial fief by the Macleans of Coll until 1848. In the northeast are the Shetland Islands, which did not officially become a part of Scotland until a Scottish Act of Parliament in 1669. The map is highly detailed, including many roads, river ways, ports, towns and shoals. Outline color and fine copper plate engraving in the minimalist English style prevalent in the late 18th and early 19th centuries. Mountains and other topographical detail shown by profile. Drawn by G. G. and J. Robinson of Paternoster Row, London, for Clement Cruttwell's 1799 Atlas to Cruttwell's Gazetteer.